Seven thousand years ago, Mt. Mazama erupted 14 cubic miles of magma. Volcanic ash rained over a vast expanse of western North America, from Canada to Nebraska. The volume of ejected material would have evenly covered Oregon nine inches deep, or Rhode Island 61 feet deep. By comparison, the tephra (airborne ash and dust) ejected by Mt. 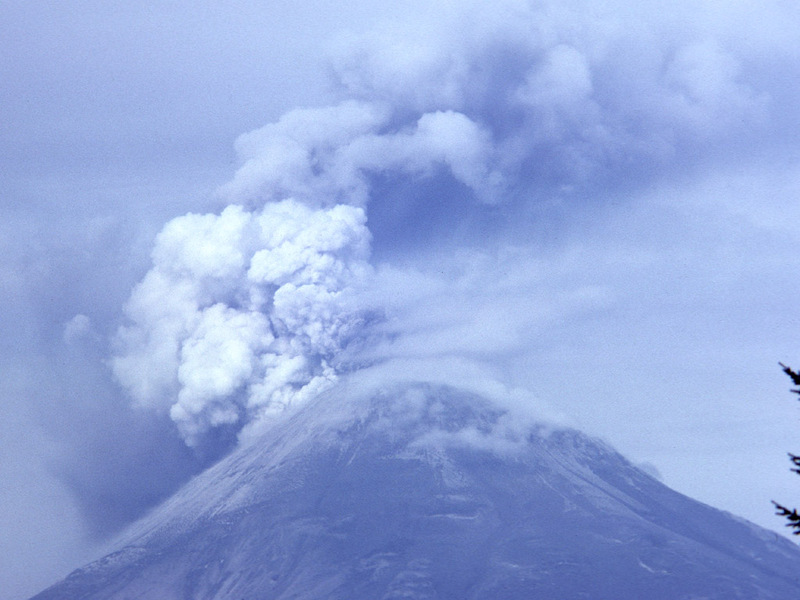 St. Helens on May 18, 1980, was estimated to be only one-fiftieth the volume. The largest of volcanic eruptions can eject more than 50 cubic miles of material. Mt. 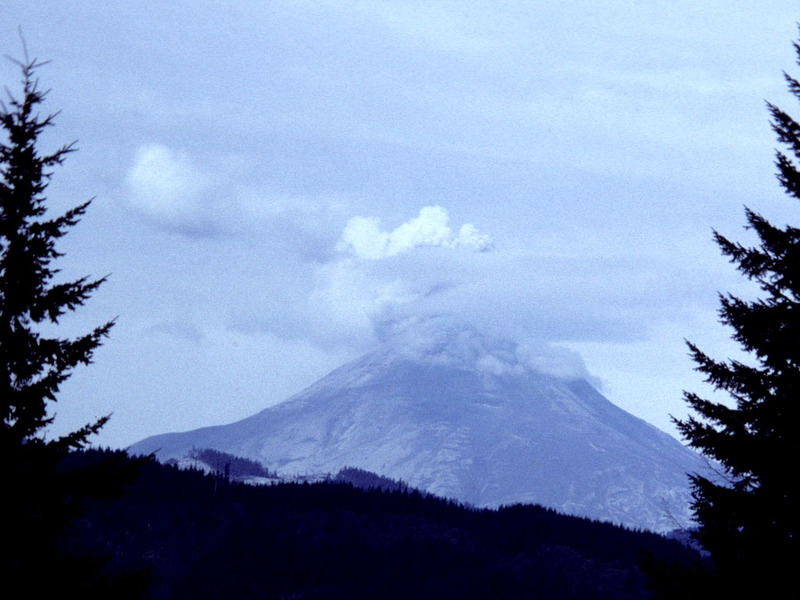 St. Helens erupting on April 3, 1980. © James Q. Jacobs. Visit the Mt. St. Helens Eruptions Photo Gallery. The Mt. 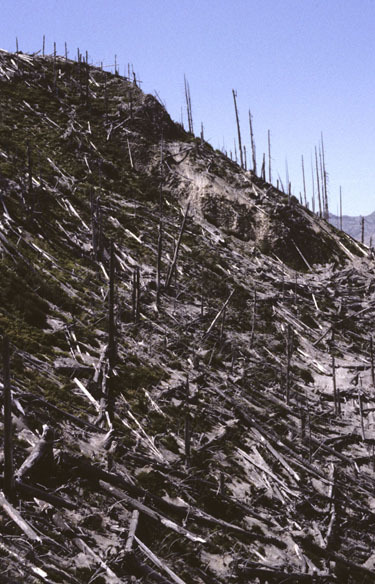 Mazama eruption obliterated one of the largest and perhaps the highest of the Cascade volcanoes. The mountain flanks collapsed into the emptied magma chamber to form a six-mile-wide caldera. Circular calderas can be as large as 15 miles in diameter. The oblong Yellowstone caldera is nearly 50 miles across from northeast to southwest. Hot springs and geysers are common in calderas. Seismic unrest at Yellowstone National Park continues, perhaps warning of future eruptions. These sites of unimaginable devastation and destruction are today's vacation wonderlands, drawing millions of visitors annually. The now quiescent Mazama caldera contains world renowned Crater Lake. This deepest lake in the United States, at 1,932 feet, is known for its crystal clear water and very blue color. On May 22, 1902, the caldera and surrounding area became Crater Lake National Park, the sixth in the nation. Today a tourist highway encircles the caldera rim. Recently renovated historic Crater Lake Lodge overlooks the tranquil lake. During summer months, National Park Rangers explain the natural wonder from tour boats that cruise the lake's 25 mile perimeter. One hundred miles due south of Crater Lake, 14,163 foot Mt. 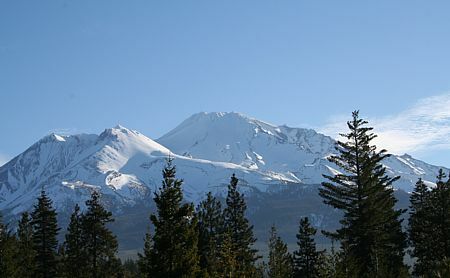 Shasta, the highest volcano in California, dominates the landscape. Near Mt. Shasta, Medicine Lake volcano covers 750 square miles with 150 cubic miles of material, by volume the largest volcano in the Cascade Range. Majestic Mt. Shasta dominates the horizon from 100 miles to the south, in the Sacramento Valley. The massive overlapping cones were extruded and ejected during the last several hundred thousand years. Two peaks on Mt. Shasta, Shastina and Hotlum, the summit, have formed during the last 10,000 years. A recent eruption created Black Butte west of Mt. Shasta and adjacent to Interstate 5. During recent millennia Mt. Shasta has erupted about once per 300 years. The last known eruption occurred about 200 years ago, perhaps in 1786. 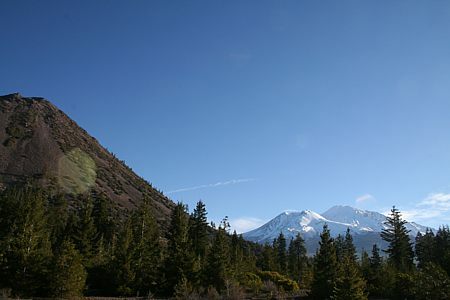 Wide angle view of the Black Butte cinder cone and Mt. Shasta from Interstate 5. More recent eruptions occurred 100 miles south of Shasta, at Lassen Peak. On May 30, 1914, a small eruption occurred. During the following year 150 explosions of various sizes were recorded. Then lava appeared in the summit crater and flowed over the crater walls. An avalanche of hot rock onto a snow field produced a lahar that traveled ten miles. 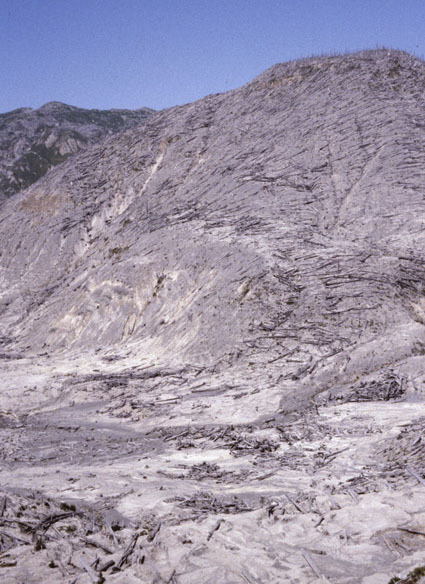 Lahars are mixtures of water, mud and debris that originate on the flanks of volcanoes. Lahars resemble rivers of wet cement. They are one of the most serious dangers posed by volcanoes. Lahars can destroy unsuspecting communities in valleys many miles from their point of origin. 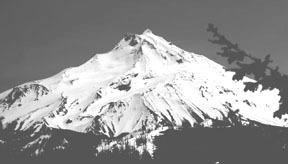 April 3, 1980, prior to the May eruption. © James Q. Jacobs. On May 22, 1915, an explosive eruption occurred on Lassen Peak, generating more lahars and floods. An eruption column rose to 30,00 feet above the crater. Fine ash was reported in Elko, Nevada, 300 miles east of the mountain. Eruptions continued until 1917. The much altered landscape was proclaimed Lassen Peak and Cinder Cone National Monuments in 1907. Lassen Volcanic National Park was established in 1916. Today the park delights the visitor with hot springs, steam-venting fumaroles and bubbling mudpots. Geothermal hot spots are aptly named the Sulphur Works, Little Hot Springs Valley, Boiling Springs Lake, the Devils Kitchen, and the Terminal Geyser. From Mt. Lassen, the southernmost of the Cascades volcanoes, the mountain chain extends north for 1,000 miles to Mt. Garibaldi in British Columbia. The Cascades range is dominated by some 20 major volcanoes. From north to south they include Mt. Baker, Glacier Peak, Mt. Rainier, Mt. St. Helens, and Mt. Adams in Washington, Mt. Hood, Mt. Jefferson, Three-Fingered Jack, Mt. Washington, Belknap Shield Volcano, Three Sisters, Broken Top, Mt. Bachelor, Newberry Caldera, Diamond Peak, Mt. Thielsen, Mt. Mazama and Mt. McLoughlin in Oregon and the California mountains mentioned. Mazama, Shasta, Lassen, Hood, Rainier and famous Mt. 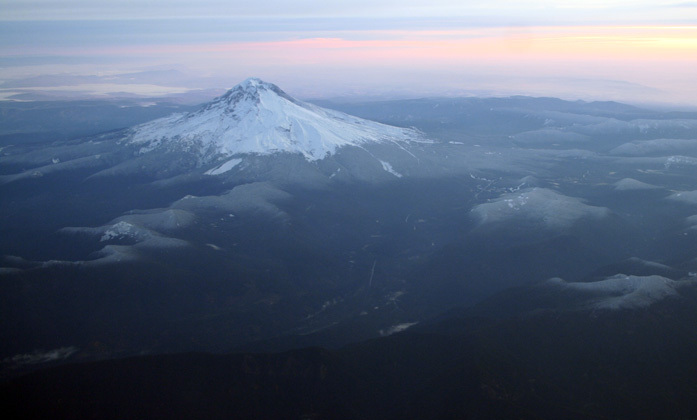 St. Helens are composite volcanoes, as are many of the Earth's grandest mountains, like Mt. Fuji in Japan and Mt. Cotopaxi in Ecuador. Composite volcanoes are built of alternating layers of lava, ash, and cinders. They rise upwards of 8,000 feet above the surrounding terrain. Because composite volcanoes tend to erupt explosively they can pose considerable danger. Shield volcanoes, in contrast, are built almost entirely of fluid lava flows, usually building a gently sloping, dome-shaped cone. Many of the largest volcanoes are shield volcanoes. Along the Columbia River gorge, between Washington and Oregon, numerous shield lava flows, totaling more than a mile in thickness, are exposed. 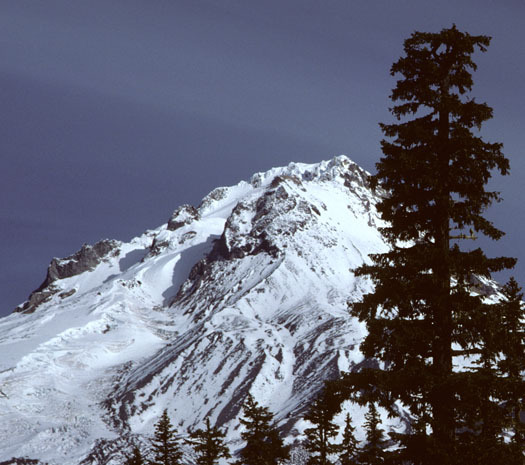 Basaltic shield volcanoes, such as Three-Fingered Jack, Washington, North Sister, Bachelor, Diamond Peak, Thielsen and McLoughlin have steep-sided cones. Highly explosive eruptions are not evidenced by these volcanoes. Typically there lava flows and thick ash deposits reach not much farther than 10 miles. Mt. Bachelor, at a mere 15,000 years old, is the youngest of these. Today the mountain features a ski lift to the 9,065 foot summit. April 3, 1980 eruption of Mt. St. Helens. This eruption spewed steam and ash from 3:15 p.m. until 3:51, and enlarged the new crater to about 100 yards. After this eruption, clouds covered the peak and the vent sealed until the May 18 eruption, when the peak was decapitated. Download the free desk picture of this image. Not all shield volcanoes are immune to violent eruption. Newberry Caldera, 75 miles northeast of Crater Lake and 15 miles south of Central Oregon's largest urban population (the city of Bend), rests atop a 500 square mile shield volcano. Newberry National Volcanic Monument was created in November of 1990. A park road provides easy access to the caldera interior and to 7,984 foot Paulina Peak, the highest point on the five-mile-wide caldera rim. From the windswept summit, Mt. Adams in Washington and Mt. Shasta in California are visible. 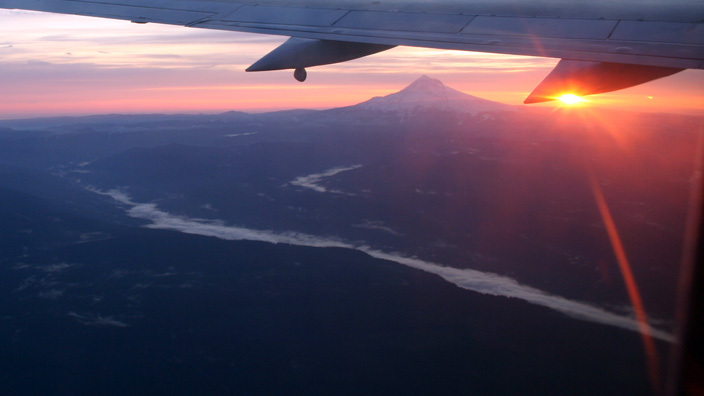 A panorama of Oregon's beautiful, snowcapped, slumbering volcanoes spans the western horizon. From Paulina Peak all the terrain visible in three states has been formed by volcanic activity. Hundreds of cinder cones, miles of lava flows, a nearby obsidian flow, and mile-wide Hole in the Ground, a collapsed magma chamber, are all visible. The caldera contains a pristine forest, recent lava flows and two crystalline-blue alpine lakes, Paulina Lake and East Lake. Where fisherman snag giant trout and families picnic in the serene forest it is difficult to imagine that a few tens of thousands of years ago a massive and explosive eruption hollowed out the caldera. The oldest known prehistoric dwelling in the region was recently discovered in the caldera. The mountain remains seismically and geothermally active, and the caldera contains warm springs. Geologist believe a magma chamber exists more than a mile below the mountain surface. Temperatures determined by drilling to a depth of a kilometer were in excess of 500 degrees F.
Within twenty five miles of Bend five major volcanoes, the Three Sisters, each a peak above 10,000 feet, 9,173 foot Broken Top, and 9,065 Bachelor Butte, dominate the western horizon. North Sister is well eroded and probably has been inactive for 100 millennia. Middle Sister was active about 20 millennia ago. The more recently active South Sister, the least eroded, has a well preserved crater. The Sisters have erupted pumice and ash falls up to 50 feet thick at ten miles from the peaks. A five cubic mile eruption is evidenced. Two lesser eruptive phases of South Sister occurred around 2000 years ago. Lava flows only 1400 years old are found ten miles north of the Sisters, at 6,782 foot Belknap Crater, the youngest shield volcano in the Cascades. Two dormant cones, 7,842 foot Three-Fingered Jack and 7,794 foot Mt. 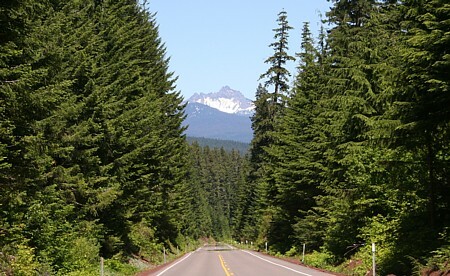 Washington, are the northern peaks of this thirty five mile long concentration of Central Oregon volcanoes. Mount Jefferson, view from Devils Ridge (west face). Continuing northward, Mt. Jefferson is a 10,497 foot composite volcano erupted atop shield volcanoes about 100,000 years ago. In the past 10,000 years small lahars and floods have resulted from non-eruptive events. Like Broken Top, Mt. Jefferson is sharply eroded, evidencing little activity during the last 100,000 years. Mt. Jefferson is visible from Portland, 70 air miles to the northwest. View from Paulina Peak, Newberry Crater Volcanic Monument, with Three Sisters and Broken Top, Mt. Washington, Mt. Jefferson, and Mt. Hood. Mt. St. Helens is barely discernable in this image. Volcanoes in Washinton and California are visible from Paulina Peak. Paulina Lake is in the foreground. Mt. Hood or "The Mountain," as nearby Portland residents often refer to Oregon's highest point, appears closer than the actual 50 miles from downtown. The 11,235 foot snowcapped cone does not evidence eruption of major tephra-fall deposits. Lava flows, dome building, pyroclastic flows and lahars characterize Mt. Hood's past eruptive history. During historic times steam has risen from the summit area of Hood, as well as from Shasta and Rainier. On Mt. Hood two significant periods of activity separated by 10,000 years of relative dormancy have occurred in very recent geological time. Both included domes extruding near the summit, magma flows and lahars moving down adjacent valleys. The farthest reaching lahars extended over 30 miles down the Sandy and White Rivers. Mt. Hood's most recent eruptive era consisted of three phases of activity separated by several centuries of quiescence. About 1600 years ago the Timberline period occurred, the Zigzag occurred 500 years ago, and the Old Maid occurred only two centuries ago. Mushroom pickers scour the mountain each fall and the debris flow areas in particular. On Old Maid Flat, a bounty of very valuable matsutake mushrooms fruits. The U. S. Forest Service has imposed a mushroom picking permit system due to high demand. To protect the fragile ecology of Old Maid Flat the number of pickers and the number of mushrooms picked are limited. Similar volcanic soils in other parts of the Cascades produce the same valuable and delicious fungus, a very unusual gastronomic experience well worth pursuing. Matsutakes prefer sandy soils. In the Cascades they abound on debris flows and in ash-fall soils. Throughout the Cascades, mushroom picking has become a significant business in recent decades. The Matsutake mushrooms are air freighted to Japan, where they may sell for upwards of $100 a fresh pound. 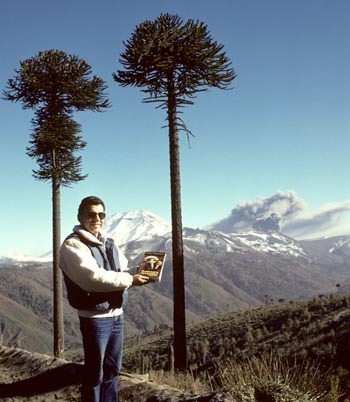 Volcan Lonquimay in Chile erupting in May, 1988. Mt. Adams, like Newberry Caldera, lies east of the Cascade Mountains. Many debris flows are visible around 12,277 foot Mt. Adams, but typically they have not reached great distances. Fumarolic emissions near the summit indicate that the volcano is capable of future eruptions. The Mt. Adams cone is about 200 millennia old. The Mt. St. Helens cone we see today formed during the past two millennia and has erupted approximately every 100 to 150 years or so since 1400 A.D. The oldest St. Helens ash deposits are only 40,000 years old. Nine main eras of activity are known, of 100 to 5,000 year duration. Explosive eruptions of up to a cubic mile of material have repeatedly occurred. A historic eruptive period, spanning from 1800 to 1857, included dome building on the north flank. If past history can predict the future, the present eruptive activity could continue for decades or centuries. Native Americans must have understood this history; they called the peak "Fire-mountain." Mt. St. Helens was North America's postcard perfect volcano when seismographs recorded an earthquake on Mar. 20, 1980. Three days later forty quakes per hour were occurring under the seemingly placid mountain. On Mar. 27, shortly after noon, a thunderous explosion shook the 9,677 foot peak and resounded across the region. Steam and ash belched over five miles high. Mt. St. Helens definite awakening after a 123 year slumber made banner headlines in the Northwest. Thousands of people gathered around the mountain to enjoy the natural spectacle, unwitting of the cataclysm to come. They were rewarded with a dozen small steam and ash eruptions. A 250-feet-wide crater opened at the summit. A coat of ashes stained the mantle of snow. From the air fractures around the crater were apparent. Cloud cover obscured the peak after a few clear days. Eruptive activity was intermittent for the next month. During May an intrusion of magma below the volcano produced visible swelling and fracturing of a large area on the north face of the mountain. 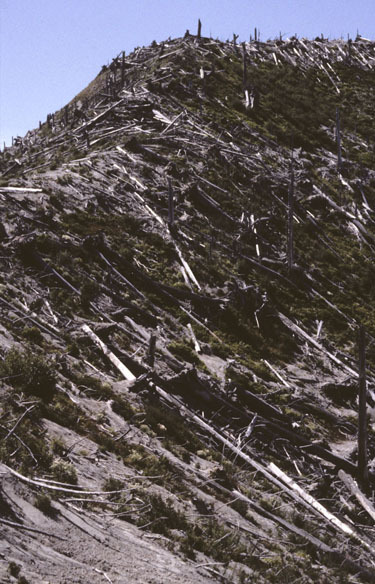 The "bulge" lifted an area near the summit more than 150 yards in elevation. In less than two months about 10,000 earthquakes had been recorded directly beneath the bulge. At 8:32 a.m. on May 18, 1980, a magnitude 5 earthquake one mile below the volcano triggered the now famous series of events that decapitated the mountain. The bulge and about a cubic mile of pyroclastic debris avalanched down the north flank into Spirit Lake. The debris raced down the mountain at 250 miles per hour and covered 24 square miles. Some of the 8 billion tons of material swept over a 1,000 foot ridge and into the Toutle River drainage, coming to rest 13 miles from the bulge. The Toutle River lahar reached the Columbia River where the mudflow blocked the shipping channel. New lakes were created atop the hundreds of feet of material that filled Spirit Lake. Mt. St. Helens from the north side after the May 18 eruption decapitated the peak. At Mt. Shasta an eruption 300,000 years ago unleashed a 6 cubic mile debris avalanche across 175 square miles. Chaos Jumbles on Lassen Peak formed around 1650. Since witnessing the Mt. 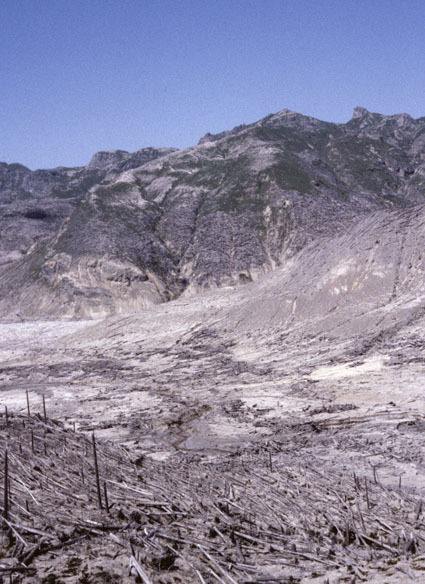 St. Helens debris avalanche, scientists have identified many other such events in the past. Seven Cascade volcanoes have erupted in the past 200 years, but none with the devastation of Mt. St. Helens. When the earthquake unleashed the overburden, the gas rich molten rock in the magma chamber exploded like the safety valve on a overheated pressure cooker. The gigantic explosion hurled a wall of rock and ash across the landscape north of the peak. A 475 degrees F. hot blast wave engulfed 200 square miles in a few minutes, scorching life up to fifteen miles away. Millions of giant conifer trees were leveled. Seventeen separate pyroclastic flows swept from the mountain. About 135 miles of rivers were washed by lahars, destroying 200 homes and almost as many miles of roads. Volcanologist David Johnston and 56 other people perished. This panorama image combines five images taken from the same tripod position. Clicking sections of the image will open larger individual images in new windows. View a high resolution version image (317 K, 1960 x 550 pixels) in a new browser window. An enormous vertical eruption of dark, billowing ash immediately rose above the decapitated peak. Within minutes it surged fifteen miles high, into the stratosphere. The eruption cloud was readily visible from one hundred miles away in Seattle and Oregon's Willamette Valley. For nine continuous hours the mountain explosively erupted with a force equivalent to a small atomic bomb each second. Half a billion tons of dust and ash descended on more than 20,000 square miles. High elevation winds rapidly transported the ash to the east. In Yakima, Washington day turned to night before noon. Three days later the dust cloud reached New York. Dust in the stratosphere circled the earth twice. Another five explosive eruptions occurred in 1980. Hundreds of small ash-emissions have occurred, producing plumes of steam and ash and a few small debris flows. Sixteen major dome-building eruptions have been recorded. By 1990 Mt. St. Helens built a lava dome in the crater about 3,000 feet in diameter and over 1,000 feet high. Eruptive activity began anew in September, 2004. Hordes of tourists continue to flock to the mountain to witness the aftermath of the violent force of nature. An area of 110,000 acres has been designated as the Mt. St. Helens National Volcanic Monument. Many campgrounds, picnic areas, and trails have been established. In 1986 a Visitor Center opened at Silver Lake, 30 miles west of the crater near Interstate 5. About a half million visitors a year stop at the Center. Some 40 miles from I-5, inside the blast zone, the Coldwater Ridge Visitor Center boasts a view of the crater from David Johnston's viewpoint. A million visitors a year visit Coldwater Ridge. Up to 100 visitors a day are allowed to climb the south side of the mountain to the now 8,365-foot crater rim. The Coldwater Ridge visitors center was evacuated on Oct. 2, 2004, after seismographic equipment recorded a harmonic tremor, indicating magma motion under the volcano and an eminent eruption. Fifty miles north of Mt. St. Helens, 14,435 foot Mt. Rainier towers miles above the surrounding mountains. Mt. Rainier erupted 150 years ago. Many floods and debris flows have originated on the mountain since. A major eruptive period occurred 2,300 years ago. The majority of the several hundred thousand acre Mt. Rainier National Park is wilderness area. The park and surrounding areas are well developed for visitation. About 100,000 people live on surrounding mudflows deposited in the last ten millennia. The next eruption could cover towns and displace tens of thousands of people. Even small eruptions can melt large amounts of snow and ice. Debris flows and lahars can be the most devastating result of eruptions at snow covered volcanoes. Large glaciers and a thick mantle of snow coat Mt. Rainier, posing a threat of devastating lahars accompanying future activity. Mt. 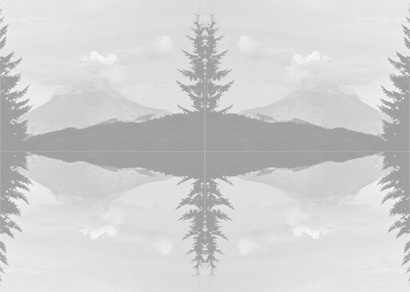 Rainier could turn deadly as did Mt. St. Helens. Three major volcanoes lie north of Seattle, Glacier Peak, Mt. Baker and distant Mt. Garibaldi in Canada. Mt. Baker has shown signs of activity in recent decades without erupting. The beautiful Cascade volcanic peaks with their pristine alpine meadows and lakes, the trout fishing and mushroom hunting, the towering conifer forests and serene wilderness areas continue to attract people. The raw power of volcanism has a special fascination for many visitors. The huge, unimaginably immense cataclysms of the past challenge the very limits of our imagination. Volcanoes are a special manifestation of the greatest forces of nature where the most dramatic transformations of the earth are boldly displayed. They communicate a lucid vision of a powerful, dynamic and ever changing earth. MORE IMAGES: Mt. 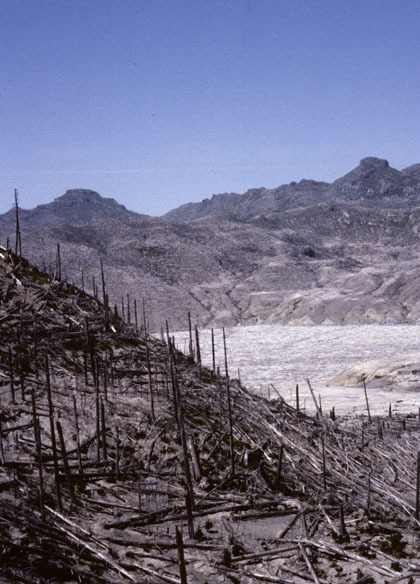 St. Helens early eruptions and destruction photo galleries.